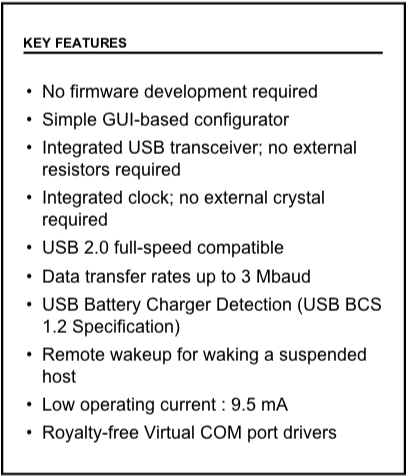 I am using a Silicon Labs cp2102n USB to uart bridge and in reading the datasheets and application notes there is no mention of putting series resistors on the D+ and D- lines. I am assuming that the reason for this is because this is not a HOST controller, but an end device. So for my own sanity be fore I send out the boards and I correct? I am assuming that the reason for this is because this is not a HOST controller, but an end device. So for my own sanity be fore I send out the boards and I correct? It might seem like nitpicking, but your assumption is false. The resistors you mention are the termination resistors of an impedance controlled transmission line and they are needed on both ends of the cable, just like with coax, Ethernet, RS485, LVDS, SATA, etc and any other high speed bus. The reason the datasheet of this prolific chip states " No EXTERNAL resistors required" is because the resistors (or something similar) are built into the chip itself.